Interpon Powder Coatings has released an updated ‘Colors of New Zealand’ colour chart designed with new features to simplify colour and range selection for customers. Created specifically for residential window and door fabricators and general trade coaters, the new colour chart includes over 100 popular colours from Interpon's stocked range in matt, satin, gloss and textured finishes. It showcases popular D1010 colours and exciting new ranges such as Textura. Elaborating on the 'Colors of New Zealand’, Eli Atallah, Sales Manager - Interpon Australasia explains that the new colour chart simplifies their offer to the domestic residential and general trade coater markets. The colour palette features Interpon’s most popular colours as well as new colours, providing a broad selection for their customers and their clients. According to Mr Atallah, the addition of Color Vitality – ‘Brights’ injects a splash of colour to the range. The Vitality range offers proven UV stability and high fade resistance, and is warranted for 15 years when applied by an approved applicator. 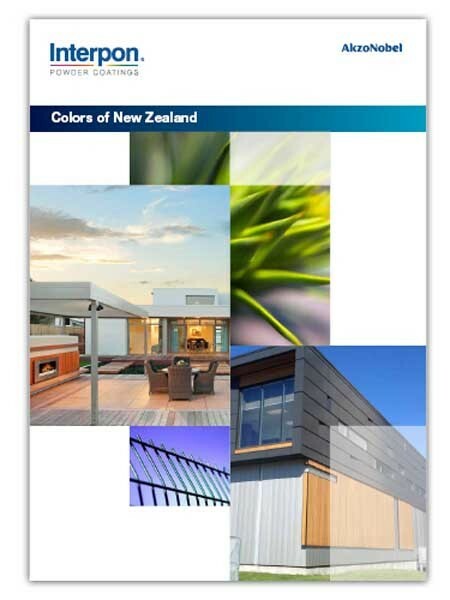 New features in the 'Colors of New Zealand’ colour chart include ranges clearly identified as ‘Exterior’ or ‘Interior’ to assist with selection; colour chips arranged horizontally to allow for desk or wall chart viewing; 25 new colour additions, including the popular Color Vitality range; new icons to identify colour application; care and maintenance instructions; cleaning instructions; and fresh new images to inspire application. Interpon values the importance of colour and finish and understands that colour expression is an extension of the project. Drawing on knowledge from their global aesthetics centre, along with insights from the New Zealand market, Interpon has produced this Residential and Industrial Powder Coatings Collection – Colors of New Zealand. Those looking for a one-off unique colour can take advantage of Interpon’s industry leading colour match and small batch service MiniB, which can manufacture virtually any colour from almost any source in quantities as small as 20kg (to coat approx. 140 square metres). The custom colour can be manufactured and delivered to the preferred Interpon D applicator in 5-7 working days. Interpon Powder Coatings is a global brand of AkzoNobel, the world’s largest coatings manufacturer. Trusted in New Zealand for almost 30 years, Interpon Powder Coatings has an enviable track record coating some of the most iconic architectural landmarks around the world.